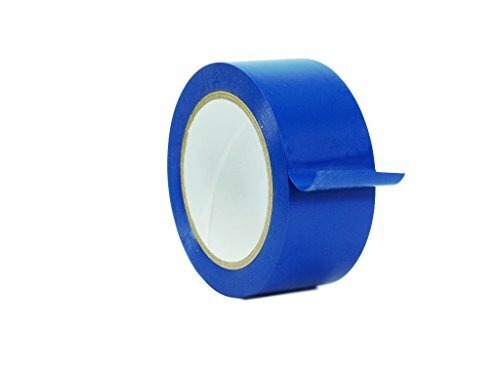 WOD CVT-536 Dark Blue Vinyl Pinstriping Dance Floor Tape, Safety Marking Floor Splicing Tape (Also Available in Multiple Sizes & Colors): 3 in. wide x 36 yds. (Pack of 1) by WOD Tape at Defy Now. MPN: WOD-CVT-536-DB. Hurry! Limited time offer. Offer valid only while supplies last. High Quality Pinstriping Marking Floor Splicing Vinyl TapeWOD CVT-536 Colored Vinyl Tape Product is of superior quality and with a long shelf-life. WOD CVT-536 Colored Vinyl Tape Product is of superior quality and with a long shelf-life. Tape has "write-on" capability. It provides a very effective vapor and moisture barrier. It is highly conformable and resistant to aging, sun, water, fungus, bacteria, oil, acids, alkalies and corrosive chemicals. It provides good abrasion, impact and rupture resistance. Yellow - White - Black - Clear - Red - Orange - Light Blue - Dark Blue - Gray - Purple - Emerald Green - Kelly Green - Brown. Color coding - Lane marking (i.e. school gym floors all kind) - Safety coding - Decorating - Striping on vehicles & Boats - Sporting equipment - Masking for hard chrome plating & anodizing - Harness and pipe wrapping - Duct and joint sealing. Use these white board tape lines for pin-striping, draping, charts, graphs, presentations, layouts, signs, hobbies, models, artwork. APPLICATIONS FOR PINSTRIPING - WOD CVT-536 Vinyl Tape is used for people looking to pinstripe their vehicles, boats, sporting equipment, and many other items. When applying WOD CVT-536 it CANNOT BE STRETCH and the surface needs to be FREE OF DEBRIS to provide good abrasion, impact, and rupture resistance. COLOR CODE FOR EASY IDENTIFICATION - Color code your cables or label other items with the 13 colors we stock on vinyl tape and save money purchasing our rainbow packs. Be able to IMMEDIATELY tell if you have the right wire or cable. BENEFITS - The superior quality vinyl tape is capable to withstand a long-shelf life, "write-on" capability, provides a very effective vapor and moisture barrier, highly conformable and resistant to aging, sun, water, fungus, bacteria, oil, acids, alkalies, and corrosive chemicals, Masking for hard chrome plating and anodizing; harness and pipe wrapping. PEACE OF MIND SHOPPING 100% MONEY BACK GUARANTEE! - We sell High Quality Vinyl Pinstriping/Marking Floor Splicing Tape in 13 OSHA Colors if you are not satisfied, we will do our due diligence to make sure you are completely satisfied with the product and service. Just send us an email, and we promise to make it right! If you have any questions about this product by WOD Tape, contact us by completing and submitting the form below. If you are looking for a specif part number, please include it with your message.